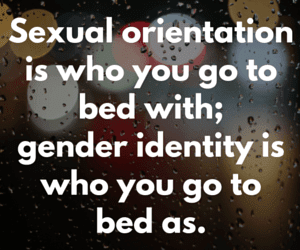 Advancing gay, lesbian, bisexual and transgender civil rights are often characterized as the most important “civil rights” issue facing our nation today. While I largely agree with this assertion, I’m also cognizant of the fact that Republican legislatures across the country have been engaged in a war on women and their reproductive rights. They’ve targeted the voting rights of minority communities in Texas, and Pennsylvania, and North Carolina, while they brand undocumented immigrants as felons and criminals who belong in jail. In my view, it’s a moral imperative for the gay community to stand with women, African-Americans, Latinos, undocumented immigrants, and all people of color, to stand up against the GOP’s assault on equality. The Grio.com’s Robert Raben wrote an excellent opinion column about what “LGBT Americans can do for civil rights,” which is a must read. I’ve written extensively about this before, and I agree with him wholeheartedly. 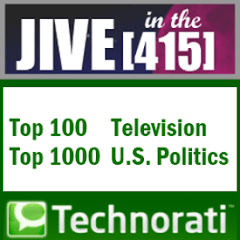 Check out the entire opinion piece at thegrio.com. As politicians in Congress and statehouses erode the foundation of equality for African-Americans and Latinos that took more than a century to build, a tide turns into a wave of progress for LGBT Americans in cubicles, in our culture and in neighborhoods across the country. It took decades for LGBT leaders to move from the shadows to the streets and now to seats of power in state legislatures, Congress and the White House. Gays were once shunned by politicians; now we are their go-to ATM, a sure sign of arrival in our political culture. Throughout this amazing evolution, the leadership of the movement — from donors to bundlers to media stars — has largely been all white. This generation’s advocates rightly embraced the mantle of civil rights, cajoling black and Latino leaders to stand with LGBT organizations on issue after issue. They won the hearts and minds of many black and Latino leaders, but the rank and file remained wary. That’s in part because people see that support as a one-way street. Investment by white LGBT leadership in communities of color politically, financially and culturally has been relatively weak, and sometimes nonexistent. The African-American heads of the Leadership Conference on Civil and Human Rights, the NAACP and the Urban League all forcefully and unequivocally push for LGBT rights, including marriage. It’s a beautiful thing: African-American leaders staunchly in the lead for LGBT advancement. The power black, Latino and LGBT Americans can have when united is tremendous. We can vote out politicians who exacerbate racial tensions; ensure all immigrants — gay or undocumented — have a path to citizenship; and name and shame corporate leaders who support elected officials who deliver laws like “Stand Your Ground” and “Don’t Say Gay.” Our faith leaders should bring us together on this agenda, not tear us apart. Being part of the civil rights movement isn’t just an honor or a rhetorical cloak, it is an obligation. Step up. 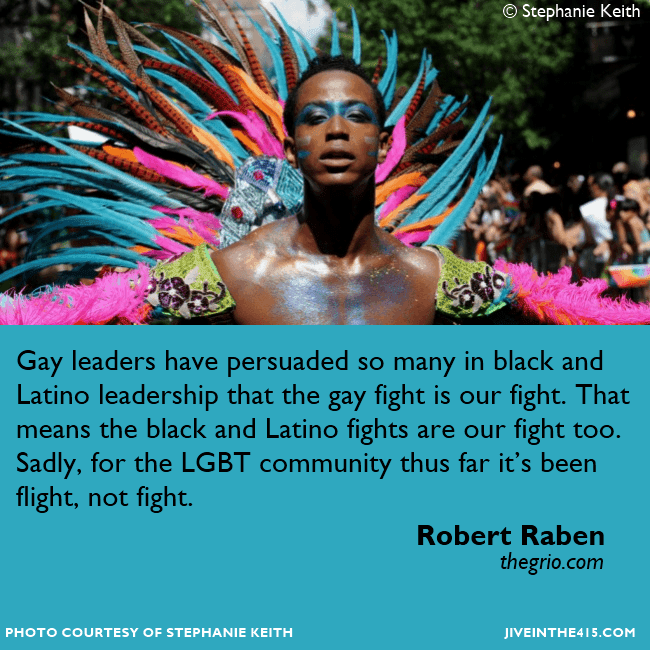 Gay leaders have persuaded so many in black and Latino leadership that the gay fight is our fight. That means the black and Latino fights are our fight too. Sadly, for the LGBT community thus far it’s been flight, not fight. 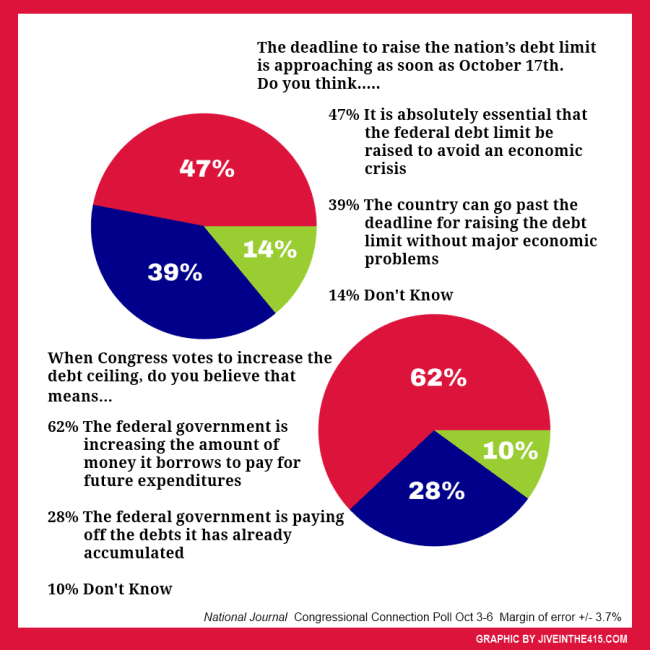 The National Journal published an interesting poll today, that illustrates the confusion and misinformation surrounding raising the federal government’s debt ceiling. All the poll actually teaches us is that whoever writes National Journal's poll questions doesn't understand the debt ceiling. The second answer, the one National Journal intends to be the "correct" response, is not correct at all! Raising the debt ceiling allows the federal government to incur more debt to pay bills it already agreed to pay. And the "wrong" answer that 62% of respondents gave is more or less true. When you raise the debt ceiling, that allows the federal government to keep borrowing money to pay for things like Social Security checks and employee salaries going forward. The point the president and Democrats repeatedly make about raising the debt limit is that it allows for payment of previously authorized expenses. Congress approved mandatory spending programs like Social Security, it wrote the tax code, and it periodically approves discretionary spending budgets. Those approvals create spending and revenue trajectories that prescribe how much money the government should borrow. If you don't raise the debt ceiling, the federal government ends up obligated to pay bills without a good way to raise the funds to pay them, and you get a payment crisis, which is bad. All that means that describing a debt limit increase as "increasing the amount of money the government borrows to pay for future expenditures" misses the point a bit. But it's still a way better description than saying it allows the government to pay off debt. Oy. New Jersey’s special election to fill the vacant US Senate seat to replace the late Senator Frank Lautenberg is a week from today. 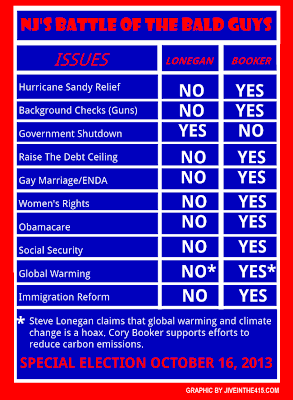 Newark Mayor Cory Booker faces right-wing wackadoo and former mayor of Bogota, Steve Lonegan. The two candidates are debating each other tonight at Rowan University in Glassboro, NJ. Sean Sullivan of The Washington Post writes that Booker has a 12 point lead in the polls over Lonegan. Newark Mayor Cory Booker (D) has held his 12-point lead over former Bogota Mayor Steve Lonegan (R) during the last two weeks, according to a new Quinnipiac University survey of the New Jersey Senate race released Wednesday. Buoyed by strong support from women, Booker leads Lonegan 53 percent to 41 percent in the new poll. The special election will be held next Wednesday. 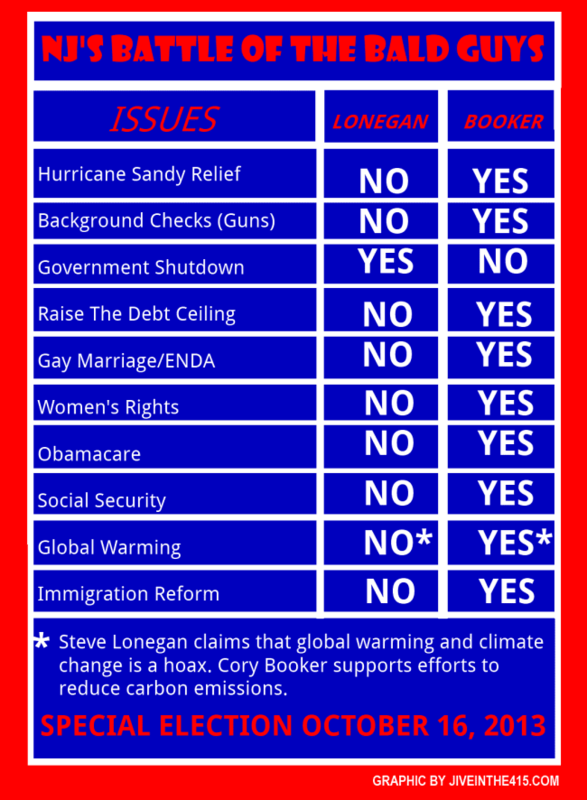 While Booker remains the clear front-runner, his once overwhelming advantage has been pared down, forcing him to go negative on the airwaves against Lonegan. Their views on national issues are starkly different, and the choice is easy. Booker is poised to win the “Battle of the Bald Guys,” and it’s imperative for voters in New Jersey to show up at the polls on October 16th, 2013 to vote.